Smartphones have become an integral part of our lives. From the moment we wake up we’re most likely to be using our smartphones the most of day. We need to either communicate with other people or use as a form of entertainment via smartphones. All these factors lead to making your battery run low. This is one of the main reasons why power banks exist. 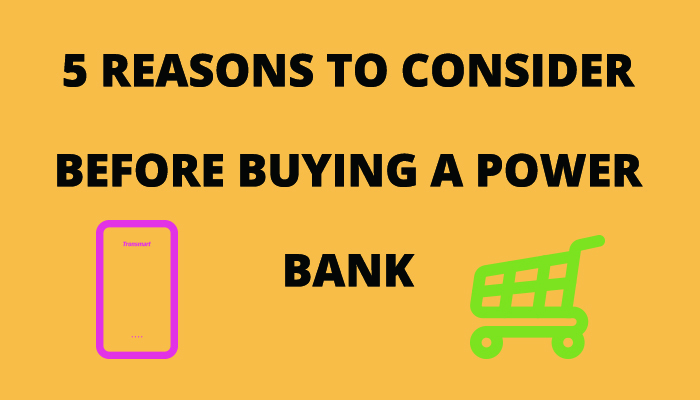 Nowadays, when you decide to own a power bank you will find out that there are many choices on the market. How do you choose the right portable charger? You should consider the following 5 listed reasons before buying a portable charger. The power bank is too big or heavy to carry around. The power bank charges my phone too slow. The power bank takes ages to fully recharge. If you choose the wrong size, your portable charger could be more than a hindrance than a help. When the portable charger is too big to be put in your pocket or too heavy to carry around, would you willing to use it anymore? If you always carry the portable charger with you wherever you go, you should consider a light power bank with a sleek design. 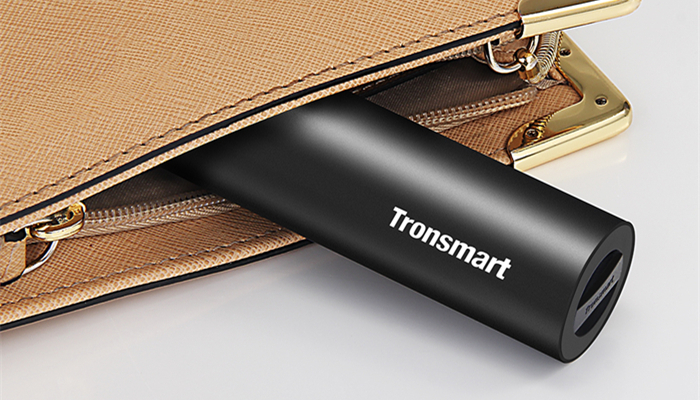 For ultra-portable size, the Tronsmart Bolt 5,000mAh would be the best choice for you. This portable charger is a pocket-friendly size that you can carry along and hold in hand easily. The next important factor you should consider is power capacity. This depends on what devices you are using and how long you will be using it for. But what we should confirm is that the mAh from the package of the power bank is not the actual battery capacity of the power bank. Not 100% of a power bank’s capacity is usable. For example, if you bought a 10,000mAh power bank to charge a phone with 2,500mAh battery, you can probably charge the phone for 3 full charges, but not 4. The same also goes for your other devices as well. How long you’re going to use it is also an important thing to consider. 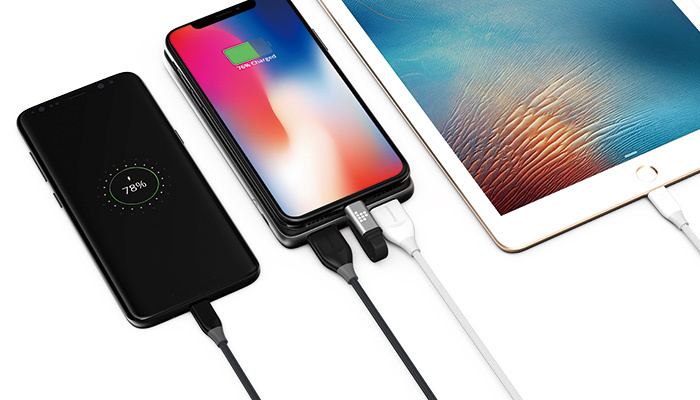 If you want to use it in office for one full charge every day, you can choose a power bank with a lower power capacity, but if you need to go out for several days then you will need a large capacity power bank. 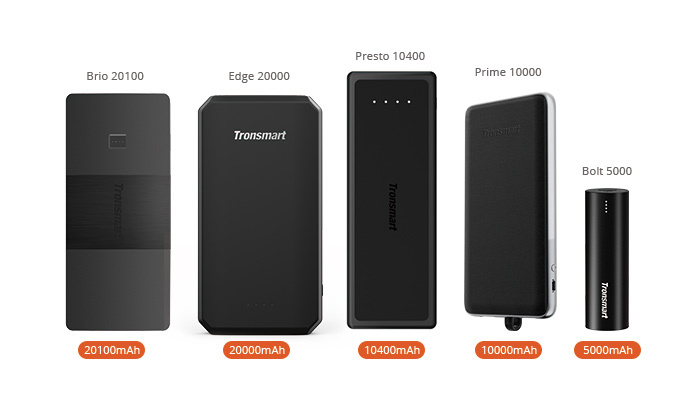 For common daily usage, the Tronsmart Prime 10,000mAh would be the best choice for you while for large capacity, the Tronsmart Edge 20,000mAh would meet your needs. Obviously, more USB ports is better for charging multiple devices at the same time. You can share your portable battery pack with friends while their phones are out of juice. However, a good capable USB power bank doesn't need too many ports, 2 or 3 ports are the best ones as long as they work with multiple devices. The charging current a power bank outputs is important. When you decide to buy a power bank you will find out that there are several types of output current which will confuse you if you do not know anything about the charging output. Let’s explain some important tips about charging specs. Most power banks output a 1A current (over 5V), which is fine if your device only accepts up to 1A. But many devices, like the newer iPhones and Android devices that support fast charging (be it based on Qualcomm’s Quick Charge or some other proprietary implementations, such as USB Power Delivery) are able to accept different current and voltage levels. Hence, it’s good to know how fast your device can charge and get a power bank that supports it. If you expect quick charging for your devices, you'd be better off choosing some power banks with quick charging outputs, generally at the very least, over 2.1A for the output amperage. As for power bank’s input power, which refers to the power the power bank is able to accept when you’re recharging it. The higher the input the faster it’ll recharge. This is more important if you’ve a high-capacity power bank. For example, a 20,000mAh power bank with a 5V/0.5A input will take two full days to recharge! That’s why you need to make sure your large capacity power bank supports a reasonable input power. 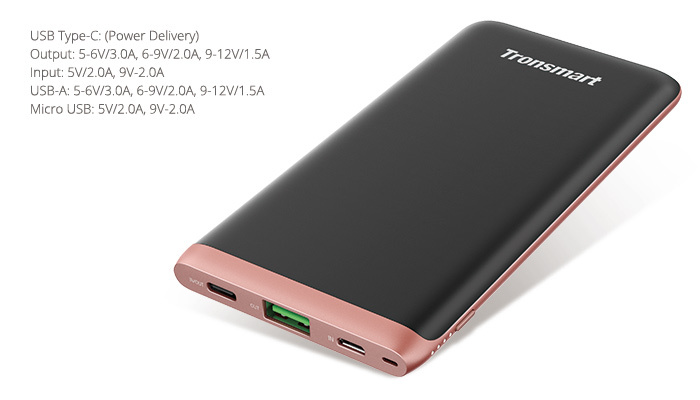 Tronsmart Trim 10,000mAh portable charger supports dual output providing optimal charging speeds for all your mobile devices while supports faster recharge the power bank simultaneously. Its slim and elegant design with high capacity fits for carrying around without any extra burdens. The last but important thing to consider is the charging safety. It’s believed that you have heard of charging devices damages or accidents caused by using low-quality or fake portable chargers. 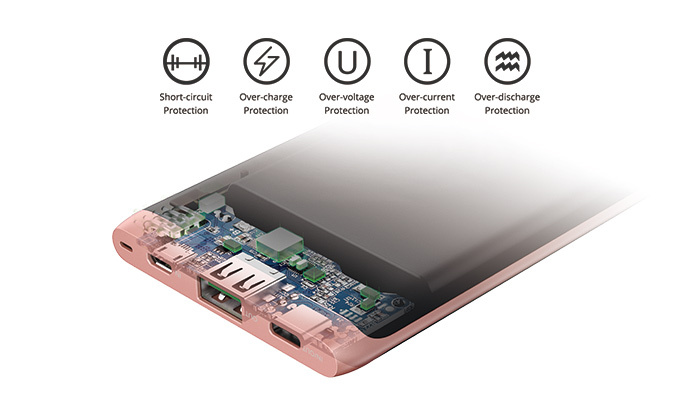 That’s why when choosing a portable charger you should confirm it has the basic certifications, like FCC, CE & RoHS; and can protect itself from short-circuits, over-charging, over-voltage, over-current, over-discharge, and more. These are the 5 things you might need to consider looking for the right power bank for your smartphone and tablet. Take every detail into consideration and make every penny you pay worth the price.